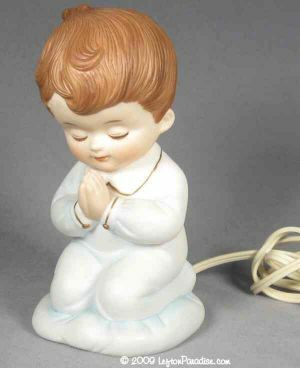 Little Boy's Prayer Nightlight - 6625 Discounts Apply ! A precious nightlight of a little boy in blue jammies saying his bedtime prayers. Standing 6½ inches tall, it's in perfect condition. The lamp is marked 6625, has a Lefton crown logo and has a Lefton sticker.